Chinese media has capitalised on the murder of kidnapped journalist James Foley and the riots in Ferguson, Missouri as a propaganda tool. Certain sections of the press in China have exploited the incidents to criticise US foreign policy and point a finger at the disquiet and ethnic divisions that exist in some parts of the United States. 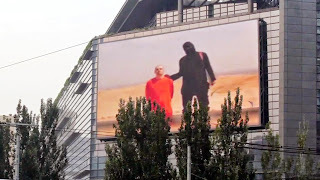 On August 20th, soon after video emerged showing Foley's execution by Islamic extremists in Iraq, Beijing-based finance magazine Caijing and Hong Kong-based Phoenix Media both published posts on their official Weibo accounts about the US journalist. "The American reporter beheaded by ISIS blamed the US government for the tragedy," Caijing's Weibo post began. It then quotes Foley as saying, "I call on my friends, family, and loved ones to rise up against my real killers: the US government," who ordered recent air strikes targeting ISIS. Whilst Foley did utter these words, Caijing crucially neglected to point out that ISIS militants had forced him to read them aloud in front of the camera. Phoenix Media's Weibo post followed in a similar vein and posted several photos of the execution including a partly censored photograph of Foley's body lying in the desert. The state-run Global Times, known for its nationalist editorials, took another tack, intimating on its Weibo account that Foley's death resulted from US government negligence towards its own citizens. The Global Times asked rhetorically on its official Weibo account, "No matter where you are, can you always rely on the U.S. military?" and followed with a nose-picking emoticon. Meanwhile in Beijing a large TV was used to display footage of the execution interspersed with riots in America that followed the shooting dead of black teenager Michael Brown by a police officer. Edited into the video loop were clips of "happy families skipping in front of various Beijing landmarks" and "photographs of local school children holding handicrafts and helping old people." "This type of juxtaposition is fairly common in China," says George of That's Beijing, adding that images of peace and prosperity in China are typically contrasted with clips of violence around the world, promoting the narrative that "chaos looms beyond our pleasant and safe borders." According to another online source, the video was unlikely to be mandated by the state. Dr. Xu Wu, an associate professor at the Walter Cronkite School of Journalism, told Quartz that if the government had the intention to use foreign violence as propaganda, it wouldn't just be in Dongzhimen in Beijing. "You'd see it across China…everywhere," he said. However, the screen in question often shows broadcasts from the state run channel CCTV. Furthermore there was an official looking logo shown on the bottom right of the screen, which we've as yet been unable to identify. Whilst the state media may be trying to exploit troubles abroad, Chinese citizens were outraged both by the murder of Foley and some of the media reportage. "Global Times, how despicable," wrote one user. "All day you use a magnifying glass to look for dirt on other people." Another user asked sarcastically, "I wonder what the Chinese government would do if you, Little Editor, were kidnapped." Across Chinese social networks there were expressions of horror at Foley's death and anger at the extremists who killed him. Many called his killers "monsters" or asked for a moment of silence for war correspondents. Some users posted pictures of lit candles on Weibo as others wished for peace in the Middle East.